In mid April 2013, two months after the air blast of the detonating Chelyabinsk superbolide had caused widespread damage to buildings and structures in the greater Chelyabinsk area, the repair efforts were still in full swing. At that time less than 40 percent of the damage was repaired, but the 129 Million Rubels the government had provided in the shape of an emergency relief fund, were already spent. As early as March 6, regional newspapers had reported that an investigation by a task force of the anti-corruption police with the purpose to fathom the whereabouts of these funds was under way. The results of this investigation have yet to become public (May 2013). In mid April many public buildings and private homes still lacked windows. 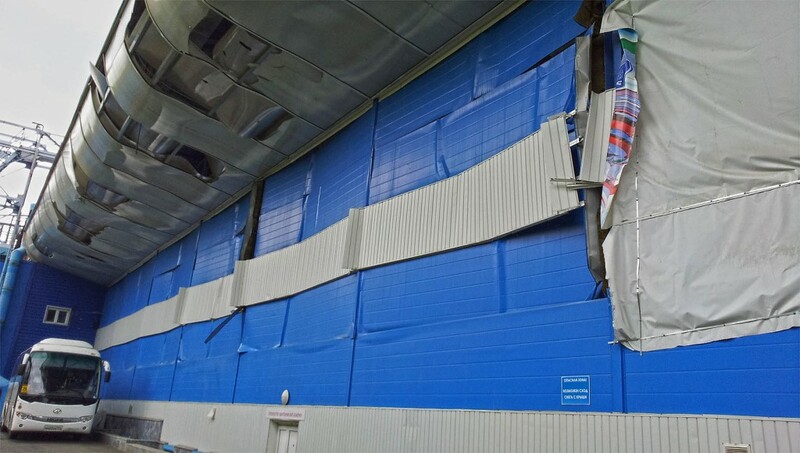 The traces of the catastrophe could still be seen at the front of the Chelyabinsk airport or on the facade of the Traktor Ledovya Arena, the city’s famous ice-rink, where the shockwave had stripped the walls and façade from large sheets of cladding and insulation. As published by the newspaper Moscow Komsomolez, the final damage and casualty assessment stated that windows of more than 7,000 buildings were destroyed and 1,700 injured citizens required medical attention. One month after the event, of the 69 victims that were hospitalized, four severe cases were still treated in hospitals. 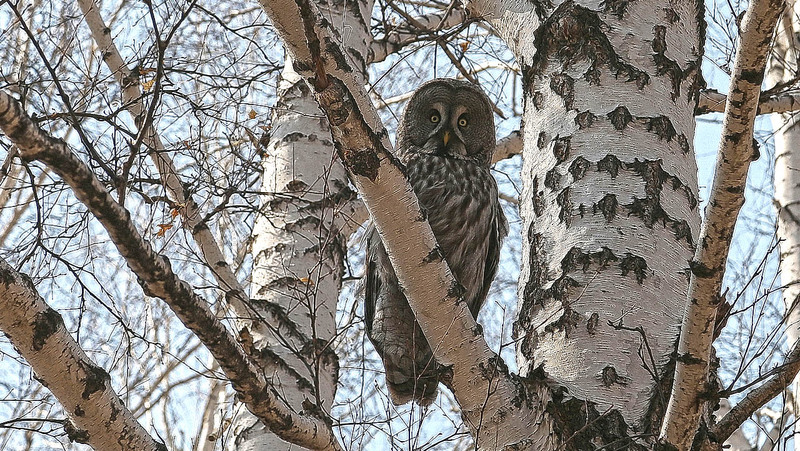 While the media attention focussed almost exclusively on the damage inflicted in the city of Chelyabinsk, the hamlets and villages directly under the bolide’s trajectory suffered no less. In Emanzhelinka windows were shattered, walls collapsed and on several houses part of the roofs were blown off. 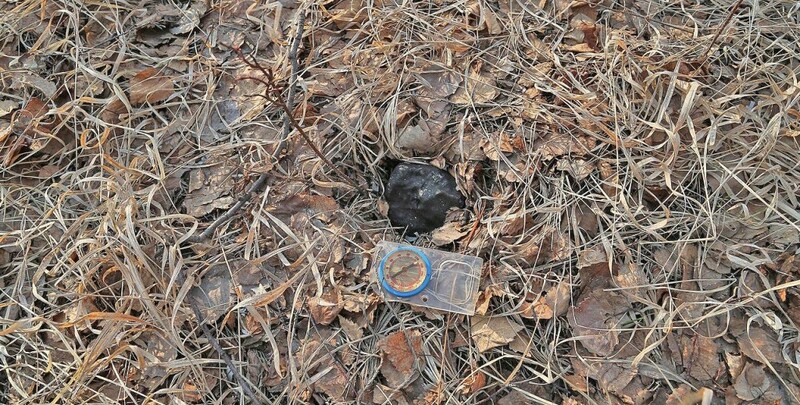 According to a report in Moscow Komsomolez (February 28), some of the villagers were unable to afford the necessary repairs of their homes and could only do so by selling the collected meteorite fragments. However, the meteorite fall and its implications were also perceived as a chance to boost the awareness for their products and to expand the tourism business in the greater Chelyabinsk area. A contest was initiated to commemorate the meteorite fall with a monument, and from the 728 proposals submitted by the public, 35 were considered by the city council under supervision of governor Mikhail Yurevich . One idea discussed in this context was the integration of a stylized meteor in the city’s emblem. Other suggestions included statues, a large fountain, a mosaic and a meteorite museum. Local entrepreneurs saw a chance for meteorite merchandise and created a number of trademarks and slogans, such as “Chelyabinsk, Russia’s Meteorite Capital” and had them registered. Current attempts to merchandize the event also invented such bizarre products as “Chelyabinsk Meteorite Perfume” and Chelyabinsk “Meteorite Car Fragrance”. Also search conditions in mid-April were less than optimal. 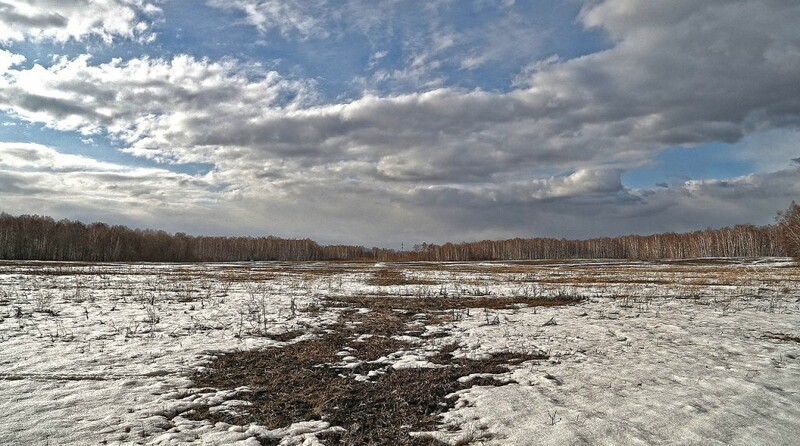 In mid April 2013 the snow cover began to retreat and slowly but steadily the hard-frozen surface transformed into bottomless mire. 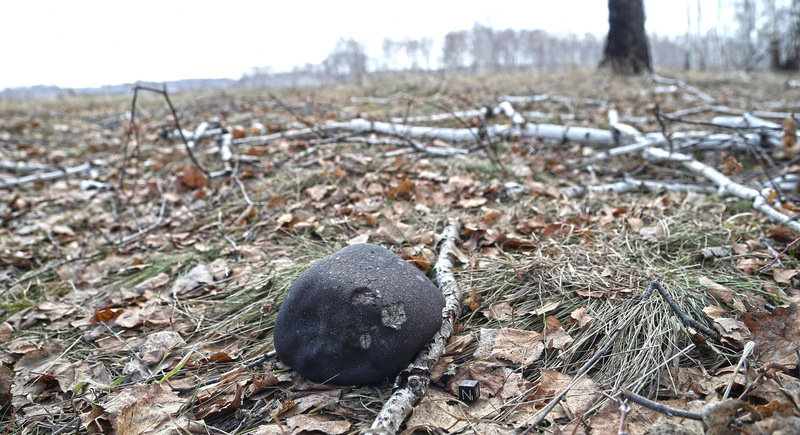 While single patches of snow remained until mid May, locals and Russian meteorite hunters, later joined by teams from the US and Poland, resumed their search in late April. With the dirt roads transformed into swamp trails, access to the strewnfield was difficult now and only possible with 4WD transport and skilled drivers. Heavy rains frequently interrupted the search, and rubber boots and waterproof trousers were the fashion of the day. Despite these obstacles, the number of people engaged in the search increased daily, and so did the find rate. 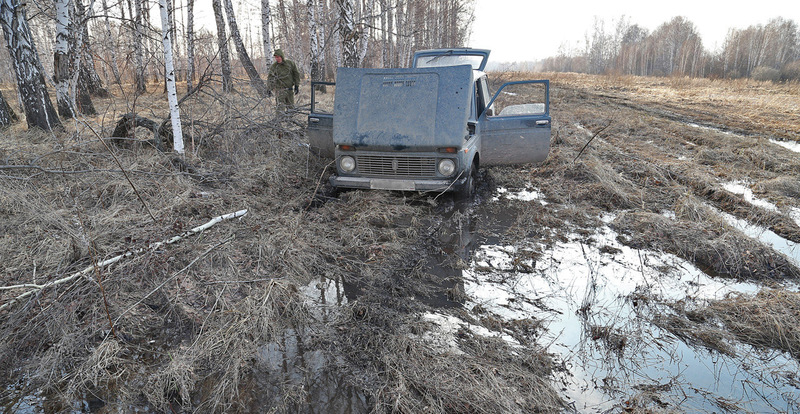 Soon it became obvious, that the Chelyabinsk strewnfield was different in several regards. While the majority of meteorite falls tend to produce a strewnfield with a simple mass distribution pattern – the larger specimens deposited towards the downrange end and the smaller masses towards the uprange end – the Chelyabinsk strewnfield presented a different pattern. 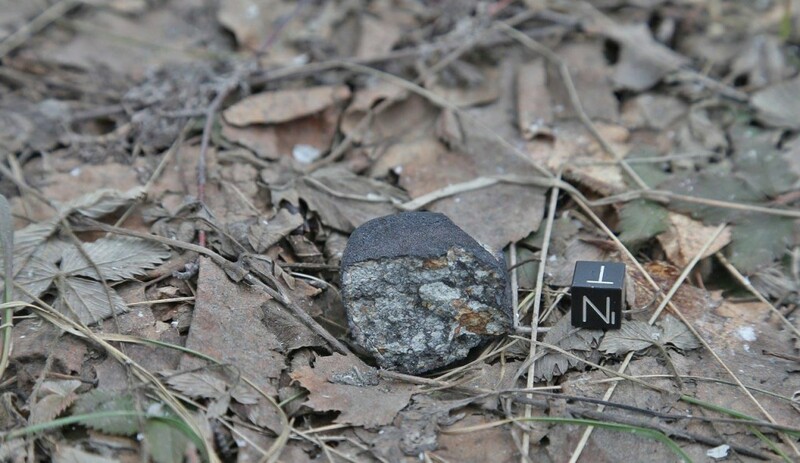 Gram-sized fragments, soon dubbed “Chelyabinsk-berries”, in several cases were found in close proximity to meteorites in the 100 g-range and bigger. Vast areas within the boundaries of the 70 x 20 km strewnfield appeared virtually free of meteorites, while at the same time in other spots numerous meteorites could be found only meters apart from each other. Obviously, the initial fragmentation, which was followed by multiple and continuous secondary fragmentations that lasted well into the dark phase of the flight, had produced several overlapping distribution areas where large and small fragments landed next to each other on the ground. Although high altitude winds contributed to a shift of the descending debris and thus led to mass sorting of some extent, the resulting scatter ellipse was vast and dominated by a chaotic distribution pattern.